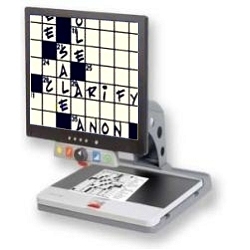 TOPAZ� Desktop Video Magnifiers make seeing type, handwriting, and small details easier than ever before. Just place an object, letter, or photo on the moveable Glide Table, and adjust the magnification level and display colors to the settings that are best for your eyesight. Your document displays in super-large size on the screen. Anything that fits on the Glide Table can be magnified: crafts, needlepoint, crossword puzzles, contracts - even labels on cans, prescriptions, and over-the-counter remedies. The TOPAZ magnifies from 2 times to 70 times the actual size on a 19" monitor. A laser pointer helps you position the item on the table.